One of the biggest current threats to global health is the rise of multi-drug resistant bacteria, caused by the spreading of antibiotic resistance amongst them. In an attempt to help fight this threat, EMBL researchers have unraveled the molecular basis of a major antibiotic resistance transfer mechanism. They also developed molecules and a proof-of-principle for blocking this transfer. Cell publishes their results on March 15. Bacteria have developed resistance to most of the drug compounds we use today. 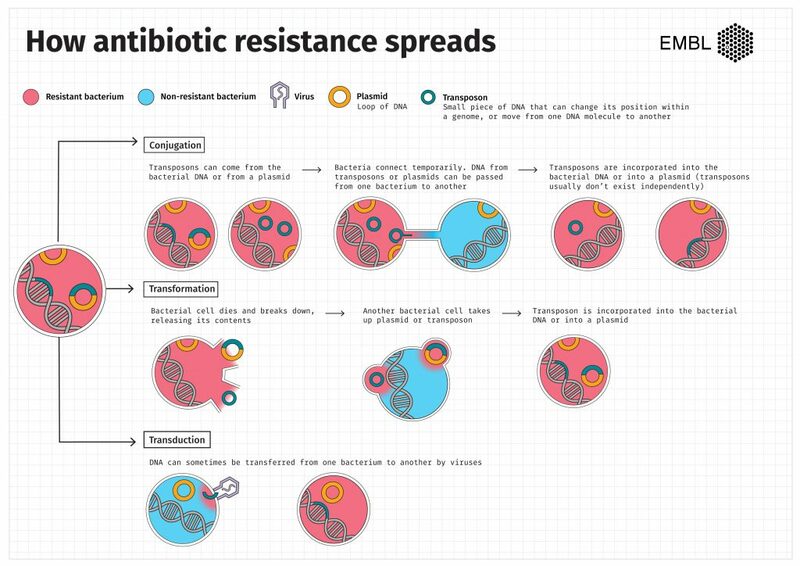 There are various routes by which antibiotic resistance can spread, as shown in this infographic (preview below). Examples of multi-drug resistant bacteria include organisms that are part of our normal microbiome and thus hard to eradicate, such as MRSA (methicillin-resistant Staphylococcus aureus), VRE (vancomycin-resistant Enterococcus), and ESBL (extended spectrum beta-lactamase) producing Enterobacteriaceae. 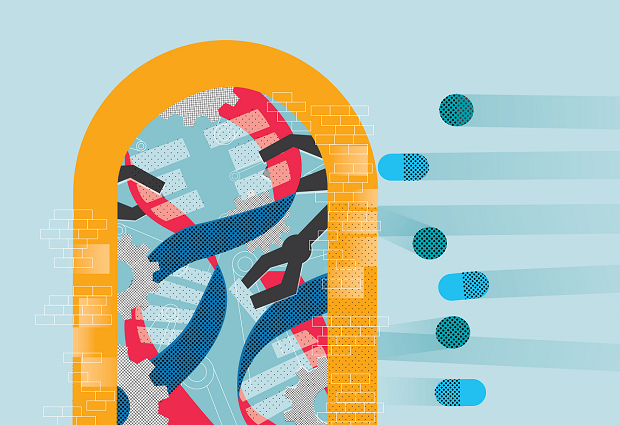 One of the major drivers of resistance spreading between bacteria are transposons – also called jumping DNA: genetic elements that can switch locations in the genome autonomously. When transferred between bacteria, transposons can carry antibiotic resistance genes within them. 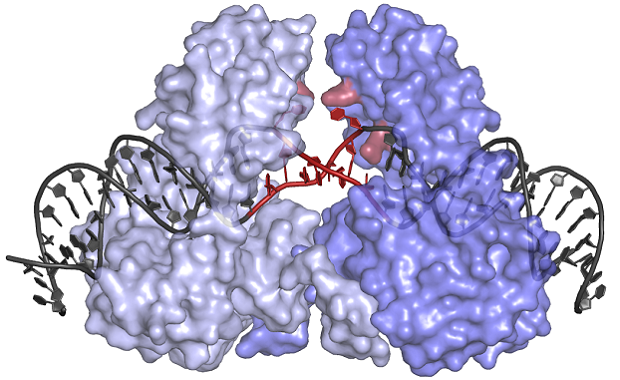 The research of the Barabas group at EMBL focuses on transposons and their molecular structure. The team now provides the first crystal structure of a protein-DNA machine that inserts the transposons, including the resistance they carry, in recipient bacteria. The research team discovered that the workhorse of the transposon insertion machine, the transposase protein, has an unusual shape (see image below). This enables it to bind to the DNA in an inactive state, which prevents cleavage and thus destruction of the transposon until it can paste the antibiotic resistance gene in the new host genome. The protein’s special shape also forces the transposon DNA to unwind and open up, allowing it to insert its antibiotic resistance cargo at many places in an extremely diverse range of bacteria. “If you think of ropes or wires, they are usually bundled and wound-up to make them stronger. If you want to tear or cut one, it’s much easier if you unwind and loosen it first”, says EMBL group leader Orsolya Barabas, who led the work. “It’s the same for DNA, and the transposon transfer mechanism takes advantage of this.” The transposase protein unwinds and separates the transposon’s DNA strands first, which makes it easier to cut and paste them in the new site in the recipient genome. Based on the crystal structure, Barabas and her colleagues also developed molecules and provided proof-of-principle for blocking the transposons movement. “In the long term, this could help control the spread of antibiotic resistance genes”, she says. They offer two strategies to block transfer, that could, for example, prevent resistance transfer in people diagnosed as carriers of antibiotic resistant bacteria. There is still a long way to go between showing the molecular structure of resistance transfer machineries in vitro and future applications. That is why Barabas and colleagues will now focus on better understanding the transfer mechanisms in real life, and testing and further developing the strategies to limit transfer. They are collaborating with research groups internationally to study these both in the lab and in the clinic.